I have to re-think my schedule. I’d initially thought I’d bake these on Wednesdays but sometimes things get in the way (like life or laziness). I plan on doing my baking, moving forward, on Saturday or Sunday. It’s easier and a bit more relaxing than doing it on a weeknight when I’m usually late from work. I had a couple of challenges this week; I forgot to add butter to the pie crust recipe so I had to do the pie crust again. File under lack of attention to detail. 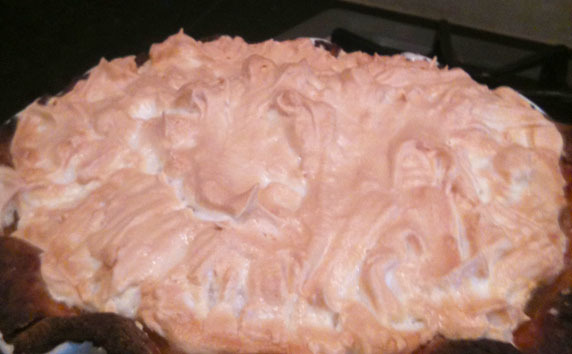 I also didn’t whip the meringue long enough so it wasn’t as stiff as it should have been. Not epic, but slight pie-fail. Blend flour, sugar and lemon peel in a food processor. Add butter and process until the mixture resembles coarse meal. Unsure of what a “coarse meal” resembles, I winged it. Drizzle 2 tablespoons of ice water and mix with fork until moist clumps form, adding more water a tablespoon at a time if mix is dry. Gather dough into ball and then flatten. Wrap in plastic wrap and chill in refrigerator a minimum of 20 minutes. Roll dough out on a lightly flowered surface to 12-inch around. 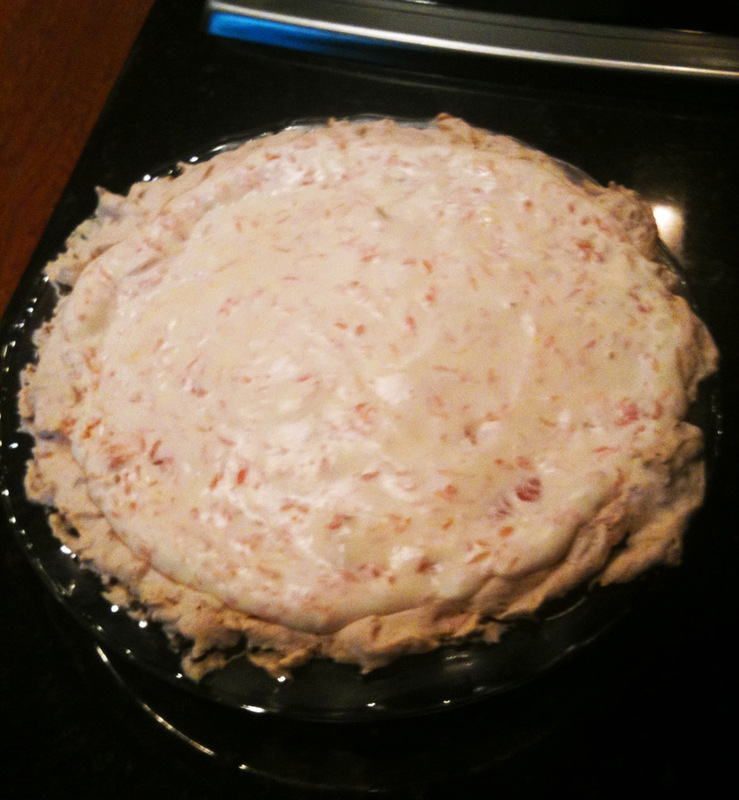 Gently roll up the dough on a rolling-pin and unroll into a 9 inch diameter glass pie dish. Fold the excess dough overhang under, even with the edge of the pie dish. Crimp dough edges decoratively. Freeze your crust until firm, about 15 minutes. Pre-heat your oven to 400 degrees F. Line the frozen crust with aluminum foil and dried beans or pie weights. Pie weights? I have never seen or heard of these… Bake until crust sets, about 15 minutes. This will keep the bottom of the pie crust from bubbling up, forming a dome. Remove the foil and beans and continue baking until the crust is golden brown, another 10 minutes or so. Remove the crust from oven and reduce the temperature to 350 degrees F. Let the crust cool while you prepare your lemon filling. Whisk the sugar and cornstarch in a medium sauce pan. Gradually whisk in the lemon juice. Whisk in the egg yolks one at a time. Stir in the lemon peel. Whisk constantly over medium heat for 10 minutes until the filling comes to a boil and thickens. Spoon the warm filling into the crust and smooth out the top. Using an electric mixer, fitted with a whisk attachment, beat the egg whites and salt in a large bowl until soft peaks form. Check. Gradually beat in the sugar and continue beating the mixture until stiff and glossy. Glossy, check. Stiff, FAIL! It was, ummmm, semi-stiff. I didn’t mix it long enough and while it was able to hold some form, definitely not enough for the big peaks one would hope for. Using a silicone spatula, spread the meringue over your warm filling, covering to the crust edge and creating peaks and swirls. My wife needed to step in here and rescue the top by adding the swirls and what she could of the peaks. For that I am grateful. 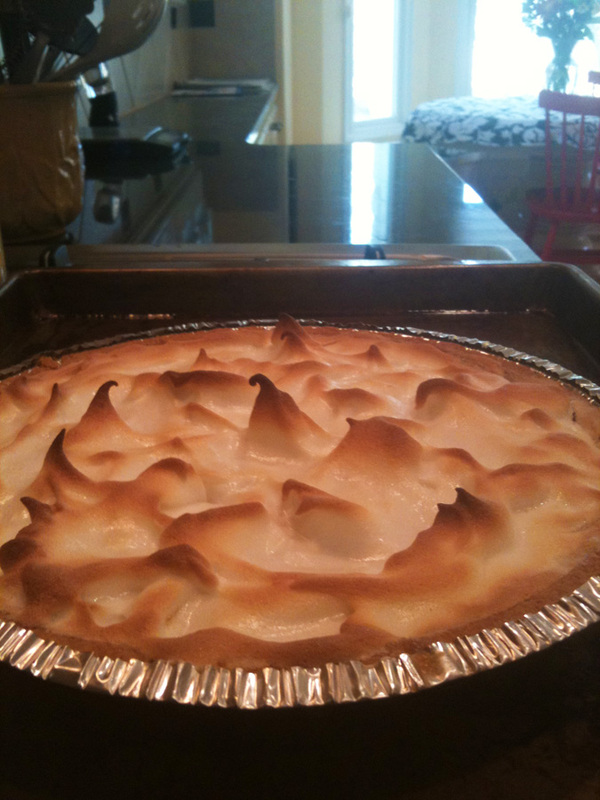 Bake until the meringue is pale golden, about 15 minutes. Cool pie completely and serve. The lemon filling really pops with sweet/tart. 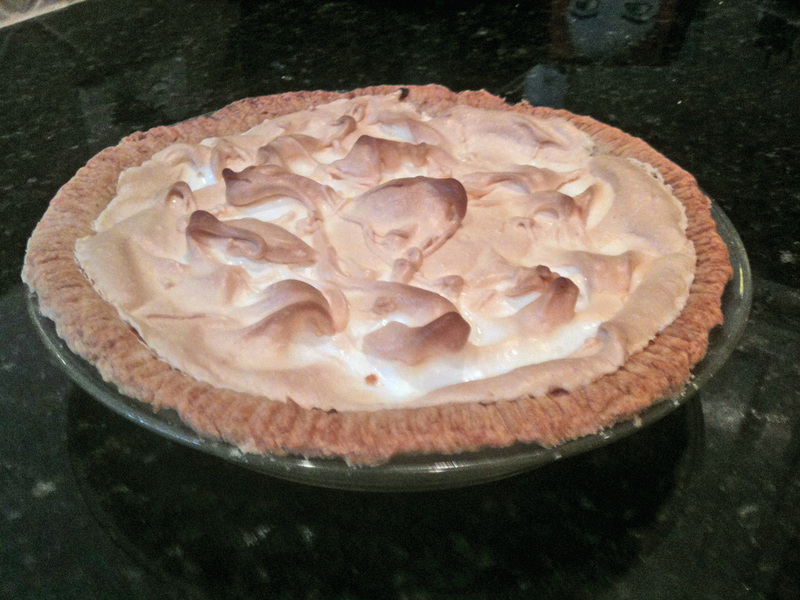 The meringue has a nice texture and the crust is nice and flaky. I’m just not pleased with the presentation and will probably try this one again.